Are you a real aliens hater? Then this game is for you! You must do everything to kill all these strange creatures, cause they wanna to capture our world. Use the weapon and kill all of them. Do only exact shoots. Have fun here. Do everything and blast those aliens at any rate! Cause the planet is infested by aliens so you have to grab that canon and blast those aliens. 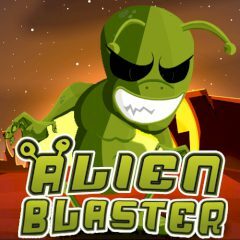 As you have already understood the purpose of this game is to shoot a gun in aliens and collect as many points. Try to remove all aliens on each level to collect as many points and go to the next level and do not forget to get on the high score list! Are you already fascinated? Then good luck to you! Use only the mouse click to control your weapon. Have a nice time here!